Vanilla, artificially flavored. 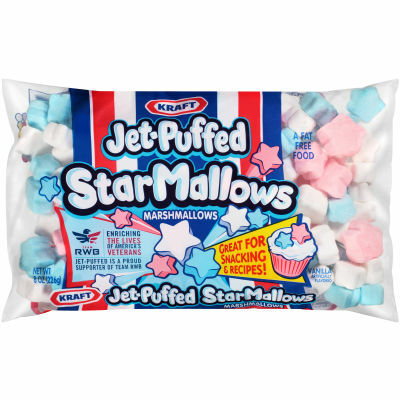 StarMallows Fun Uses: Going to a party? Bring your favorite snack mix with some Jet-Puffed StarMallows Marshmallows tossed in for a patriotic twist. For an indulgent treat, serve Jet-Puffed StarMallows Marshmallows as dippers for warmed Baker's Dipping Chocolate. Sprinkle Jet-Puffed StarMallows Marshmallows over a scoop of your favorite ice-cream. Top frosted cupcakes with Jet-Puffed StarMallows Marshmallows. Serving size 17 pieces (30g).